With back-to-back Final Four appearances the last two seasons there is little doubt UCLA has reclaimed its place among elite college basketball programs. Blue-chip recruits around the country are regularly listing UCLA as a top destination, and kids in the West look first towards Westwood before anywhere else. A top-ranked incoming class in 2008 attests to the program's renewed drawing power. Despite all the recent success, the eleven basketball championship banners hanging in the rafters at Pauley Pavilion remain a stark reminder to players and coaches of the annual expectations set for the team. Yet, players and coaches alike don't shy away from the lofty expectations, moreover many of them embrace the challenge set by Bruin greats of the past, claiming the reason why they chose UCLA in the first place was due to the tradition of winning. 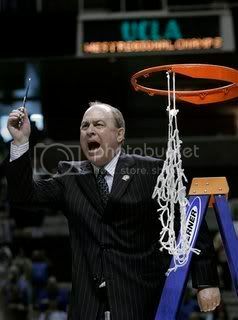 In four seasons Head Coach Ben Howland has compiled a record of 91-41 (.689) including 30+ win seasons the past two years - only one coach (John Wooden) in UCLA history has more 30+ win seasons. His turnaround of a program, which had fallen on hard times under his predecessor, is now complete. 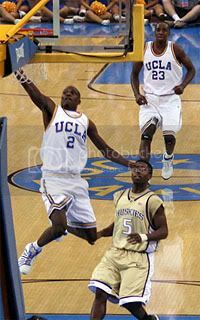 The next goal is a NCAA championship, whether it happens this season remains to be seen; but it appears this 2007-08 team may give him his best chance of winning it all since he's been at UCLA. Although Coach Howland may change his offense to an extent based upon the strength of his personnel, the focus on defense remains unchanged. Defense wins championship is still the working theorem followed at UCLA practices. The Bruins lost Arron Afflalo, who was taken in the first-round of the NBA draft, from last season's club, but they return a solid nucleus of veterans and have added key pieces for their tourney run. The Bruins have a total of eleven scholarship players on the roster which includes: one senior, five juniors, three sophomores, and two freshmen. Kevin Love: As one of the most anticipated arrivals in recent Bruin history, Love finally joins the Bruins amid sky-high expectations and hype. Has he been worthy of all the attention? Since practice began over two weeks ago, Love has been the leading rebounder on the team, scored effectively off the low blocks, and has proved he can hit from the outside consistently. Despite getting a little banged up during practice, the 6'10 260 lb freshman has shown he can dish it out too as he learns the nuances of the team's system and rigors of playing against quality big men everyday. While Love gives the team a consistent inside scoring presence it has lacked in past seasons, it's his ability to rebound and outlet pass effectively to ignite the fastbreak that may change the Bruin offense from one that relied heavily on its half-court execution to one that scores more often in transition. One of the biggest adjustments for Love this season will be on defense. He'll be consistently facing bigger and faster competition than he's ever played before. But its a challenge Love embraces since he understands that he needs to improve his defensive skills if he expects to be successful at the next level. Coach Howland has not announced his starting line-up for the first regular season game, however, Love has worked hard in practice and has been one of the team's top players. There is nothing to suggest at this point that he won't be lining up on the court at tip-off time. Chace Stanback: Stanback quietly slipped into Westwood amid all the attention given to his fellow freshman, however, he has been solid in practice and has impressed Howland with his effort, especially in rebounding. Howland reported the 6'8 Stanback was the team's fourth best rebounder during all scrimmages. He has shown a knack for finding the ball and an aggressiveness which lends to his rebounding ability. Stanback still needs to improve his outside shooting and overall understanding of the game at this level. Barring injuries on the team, Stanback is not expected to play a significant amount of minutes this season, however, he appears to be a solid Howland-type player who should be a solid contributer over the next few seasons. Darren Collison: The Bruins' starting point-guard seriously considered entering the NBA draft after last season where he was projected by some to be a first-round draft choice. At the end, Collison made the right decision to return to UCLA for another year to hone his skills further under Coach Howland. Collison, who is known for his speed and quickness, expanded his game last season by improving his outside shooting and his play-making skills. He shot 44.7% from beyond the three-point arc for third best in the Pac-10 while averaging 12.7 points and 5.7 assists a game. Howland considers Collison to be the team's best on ball defender. His quickness allows him to hound opponent guards endlessly throughout games - he averaged 2.2 steals last season. With the addition of Kevin Love and the subsequent improvement in team rebounding, the Bruins are expected to run more in transition this season. In practice, Howland has been urging his guards, specifically Collison, to push the ball up after every change in possession to put pressure on retreating defenders. With the personnel on the team, this may be the season the Bruins begin to rely on their fast-break as a primary weapon on offense. Josh Shipp: The red-shirt junior underwent hip surgery over the summer but he appears to have fully recuperated. Shipp is the team's top returning scorer from last season and is expected to help make up some of the scoring slack from Afflalo's departure. He was inconsistent with his outside shooting last season averaging just 31.6% from three-point distance. However, Howland has reported that Shipp has shot extremely well in practice and expects him to be one of the team's top scorers. Shipp will likely start the season at shooting guard, but will probably spend time at small forward as well. On offense, Shipp's ability to hit from the outside and drive the lane gives the team options on the wing, but its still unclear how effective he will be in defending the opposition's shooting guard. While Shipp averaged 1.8 steals a game last season, he finds himself out of position at times on defense and may have difficulty covering a quicker guard. If Shipp expends the effort on defense to stay in front of his man, he can be effective, if not, then the Bruins will need to either go to Russell Westbrook at times at shooting guard or even perhaps shift Luc Richard Mbah a Moute to guard the two if necessary. Luc Richard Mbah a Moute: Mbah a Moute is looking to improve on his sophomore campaign where both his scoring and rebounding totals decreased from his prior year. Although the junior forward won't readily admit it himself, he was bothered most of last season by tendinitis in both knees which seemed to limit his explosiveness. However, he underwent therapy and improved his training regimen to strengthen the muscles around his knees over the summer and declares himself completely healthy. He worked with assistant coach Scott Garson to improve his outside shooting over the summer. Mbah a Moute has shortened his shooting stroke which has resulted in a more consistent motion, and he has reportedly been shooting well in practice. If he can carry over his success in practice into the regular season, then Mbah a Moute may be in store for a break-out season. Lorenzo Mata-Real: The senior center has improved his game every season at UCLA and his physical presence underneath anchored the defense last year. Mata-Real will likely split time at the the center position with Love, although he will also likely play alongside him with Love moving over to the four spot. It wouldn't be surprising to have both Mata and Love in the line-up to start the game. Mata-Real worked hard over the summer to improve his offensive repertoire, and reports from practice indicates he is scoring more effectively from the post. He has been injury-prone during his career at UCLA, mainly due to his all-out style of play, however for the team to be successful this season, Mata-Real needs to stay healthy. With only eleven scholarship players, the Bruins can ill afford to lose Mata-Real, or any player for that matter, for prolonged periods. Michael Roll: The junior sharpshooter has been impressive at practice this year. While he is not the quickest player on the team, Roll works extremely hard on defense and does a good job staying in front of his man to the point that the coaches have confidence in playing him against good offensive scorers. In his third year at UCLA, Roll has a solid understanding of the system and knows his role on the team. He is a good passer, especially in feeding the post, which is important this season with Love in the paint. Roll's ability to play both the two and three spots and his experience will play a big part in the Bruins' success this season. Russell Westbrook: At the start of practice this year, Coach Howland stated he thought Westbrook may be the most improved player. Over the summer, Westbrook worked hard everyday at the Men's Gym playing against NBA players and top college players to improve his game. He is explosive off the dribble and is arguably the team's most athletically-gifted players. Westbrook will start the season backing up Collison at the point, although Howland expects to play him alongside Collison at times during the game. He feels a dynamic combination of Westbrook and Collison in the backcourt will be difficult for most teams to defend. More recently in practice, Westbrook has not demonstrated the level of patience at point-guard that Howland expects at the position, at times playing too out of control. With limited options after Collison at point, much of the team's success will depend on Westbrook's ability to harness his game and play within the team's system. Alfred Aboya: Aboya's role on the team the past two season has been to be a physical presence. While the Bruins need him to continue his aggressive play, he now may be able to provide some scoring as well. Over the summer, the junior worked on his mid-range jumper and has improved to the point that Howland has confidence in his ability to hit the open jumper in games. Aboya's ability to play both the four and five off the bench gives Howland flexibility in his rotation. His ability to hit the shot consistently will make players guard him honestly rather than play off him when he has the ball away from the basket as they did last season. Nikola Dragovic: Where does Dragovic fit on the team? On one hand, he is perhaps the team's best outside shooter from deep and is an excellent passer. Dragovic is also a seasoned player, having played a significant role on the Serbian national team's championship over the summer. On the other hand, he needs to demonstrate to the coaching staff that he can play effective defense at the Division I level. At 6'8 with average speed, Dragovic may have problems guarding quicker wing players, while at the same time does not have experience in guarding post players inside. While Dragovic may be useful against zone defenses and provide the team instant offense off the bench, unless he improves his defense it may be difficult for him to find time in the rotation. James Keefe: From most reports, Keefe had been playing very well over the summer and his strength and weight conditioning had much to do with his success. However, his shoulder injury and subsequent surgery has set him back. The Bruins need Keefe this season to provide depth inside the paint. He is not expected to return to the line-up until mid-December. Good overview, as always - thanks. This really has the potential to be a special UCLA team. I continue to hope that Dragovic will find some real minutes. Not that I've seen him play all that much, but from all the reports that I've read about his shooting, not to mention his considerable experience in Euro play, I have to believe that he could be a potent offensive weapon for us. I think Westbrook is going to have a break out season too this year as long as he stays under control. Great preview. Thanks. Nice pre-season article, but I take exception to your writing that Josh Shipp has trouble staying in front of his man on defense. There was no sign of that last year and will not be a problem this year when he plays the 2. This is an old and silly fallacy from a pay web site that has denigrated Shipp since his freshman year, and will again be proven false. Shipp has the lateral quickness stay in front of most players, but have noticed that he has a habit of gambling on defense - its not a surprise he averaged 1.8 steals a game last season, but as a result he finds himself out of position or is slow in rotating to his man at times and thus has a problem staying in front of him. Shipp has looked good in practice and has a great attitude about the upcoming season. 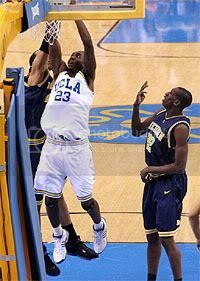 Do agree, he is going to have a good season this year - the Bruins will need his production on both ends of the court. Thanks for the fantastic updates BBR! Any news on the renovation? Are they going to put seats closer behind the baskets next year? Also, is J. Morgan still going to announce his decision tmmrw(Friday)? Will he be a Bruin? Thanks! I forgot to post on my last message that your inside information is just sick! It's almost like your Ben Howland! Who the hell are you? If more fans knew about this site it would be rock'n! Can you possibly add a hits counter so we can see how many people are viewing this site? We really appreciate what your doing BBR! Who the hell are you? The school is still maintaining a 2010 time frame - we're a bit skeptical at this point based upon the progress made. As for Morgan, we'll find out today (Friday). He's holding a press conference to announce his decision. Thanks for the note, Scott. What happened to Luc Richard Moute?